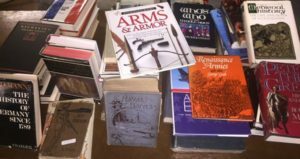 Soldiers & Sailors Book Sale | Soldiers & Sailors Memorial Hall & Museum Trust, Inc.
Background note on our book collection: Over the years, Soldiers & Sailors Memorial Hall & Museum Trust, Inc. has received hundreds of donated books from the community. Many of the books directly impact our mission to honor and remember all service members and our ability to educate the community regarding US military history. However, we often receive materials that do not complement our mission, such as literature regarding ancient history, European archaeology and other foreign topics. We also receive duplicate materials. We sorted through our collection in order to make room for books which advance the mission of Soldiers & Sailors.